Although, the rental housing sector is heavily regulated, the system is in favor of landlords. The landlord is covered by the guaranty money and there are no restrictions regarding discrimination of tenants. Rents: Can landlord and tenant freely agree rents in China? China has old rent control laws, remnants of the Cultural Revolution (1966-1976). These controls are not strictly implemented and laws and regulations are being passed at the local level to remove these restrictions. There is no rent control in major centers such as Beijing, Shanghai, Guangzhou, and Shenzhen. Rent adjustments are subject to the provisions of the contract. Most monthly rents are quoted in USD. However, due to the switch to floating exchange rate regime, rents quoted in RMB are growing. Within 20 working days after the end of the tenancy, the guaranty money is returned without interest and after deducting costs for repairs and unpaid utilities. If the deposit is not sufficient, the tenant is usually required to remit the amount within the 15 days. 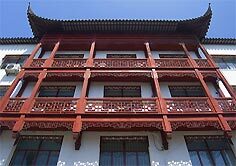 What rights do landlords and tenants have in China, especially as to duration of contract, and eviction? The usual lease term is 12 months with an option to renew for a 2nd year. If the tenant wishes to renew the contract, he must notify the landlord two to three months before the expiration of the contract. If the landlord wishes to unilaterally terminate the contract prematurely, he must pay double the down payment and double the guaranty money, a total of about 8 months' rent. If the tenant prematurely terminates the contract, he will lose the guaranty money and down payment. The tenant is charged 0.5% interest per day for late payments. If the amount remains unpaid for 20 days, the landlord can terminate the contract and take the guaranty money. If the tenant subleases the house without the landlord's written consent, which shall constitute a breach of contract and entitle the landlord to compensation worth 3 months' rent. If the tenant does not remove his properties from the rental unit 10 days after the expiration of the contract, the landlord is entitled to dispose of the said properties without any compensation to the tenant. Subleasing is generally not allowed. How effective is the Chinese legal system? Most contracts ask for a friendly settlement for disputes regarding landlord and tenant relation. Households have to obtain permits to lease out their properties, and all tenancies and sub-tenancies must be registered with the respective local agency such as the Beijing Municipal Public Security Bureau. There is no specific national law dealing with landlord and tenant relation. Legislation is passed by local government units; circumstances can vary widely in two different cities. In 2000, the Beijing municipal government allowed its residents to legally rent out their property for profit. How high are estate duties in China?